This is definitely my new favourite shark stamp. I love his smiling face and goofy overbite. So cute! The inked background was a happy accident. It was an inking exercise gone wrong that I almost threw out but in the end I liked the weird texture and thought it would make for a good ocean background. Looking forward to seeing what direction the cue word takes you. Check out the gorgeousness from the rest of the design team then play along! 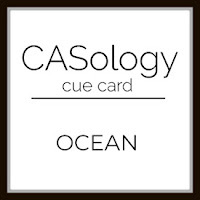 Link your creations to the CASology blog by Monday, 1 April at 9am (CDT). Totally jawsome card! Love it! Fun card, Jen! Love the gradient of the water! The contrasting orange dots are a great touch! Can sharks be cute? I think that this one is lol. I have this set just waiting to see ink! Love your use of it for this fun card. Looks like a perfect background for him!